Ai Weiwei’s freedom to travel was reinstated in the autumn and he was able to attend openings of his big European shows, first in London at the Royal Academy and then in Helsinki at the renovated HAM Museum. Two spaces with very different cultural connotations, something that Ai’s work also plays with. At the moment Ai is travelling around Italy and Greece, helping refugees as well as researching for a forthcoming exhibition in Florence on the meaning of Renaissance architecture. 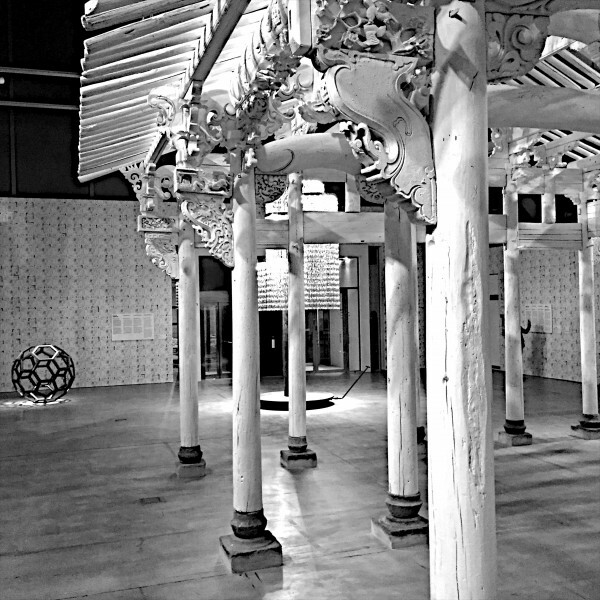 Where the London show was a survey of the many ways in which Ai’s art addresses his relationship and the complex ideology of China, in Helsinki it’s all about wood. Curators at HAM were not immediately convinced about Ai Weiwei’s suggestion for wood as the central theme, which could seem obvious in the Finnish context, where the forest has always been a key element of the national identity. Not only economically, but also ideologically representing purity and a connection to nature. The show starts with Ai’s snapshots of his middle finger against some key Helsinki icons, taken during a 2001 trip with his wife Lu Qing, and ends with the famous video clip with Ai dancing Gangnam-style. When I visited the show a Finnish teenager dressed in rapper style couldn’t get his head around why Ai is showing his middle finger, despite his mum trying to explain the critical context. But perhaps in the end Ai’s sense of humour might have sunk in, who knows. Ai’s big un-completed architectural ambition is showcased in Helsinki through a large wooden model of the villas commissioned for Ordos, a remote Mongolian village, which remains unbuilt. A video recounts the scale of Ai’s architectural dream, but the purpose of the grand project remains slightly obscure, as Tommila points out: “The strongest contrast in the exhibition rises from seeing Ordos 100 together with all the other works. For me as architect, this work shows itself as a kind of conceptual insanity; the sad reality emphasized besides the mastery of other works on display. Here urban planning seems to be just a playground of concepts and crafted models, which is the only reasonable conclusion to be made of the plan area.” However it certainly demonstrates how Ai’s vision has always challenged the edges of reason. A group of those haunting trees were also in London, assembled on the courtyard of the Burlington House, surrounded by the Palladian architecture. Overall the effect of the show is very different in Helsinki where the space given to HAM is relatively small. Taken into account the size of the 1930s building, designed originally as indoor tennis courts, the cinema complex seems to have ruled over the museum space.